printed the number of guaranteed hours based on using batteries at least 4 hours daily. service you have received. 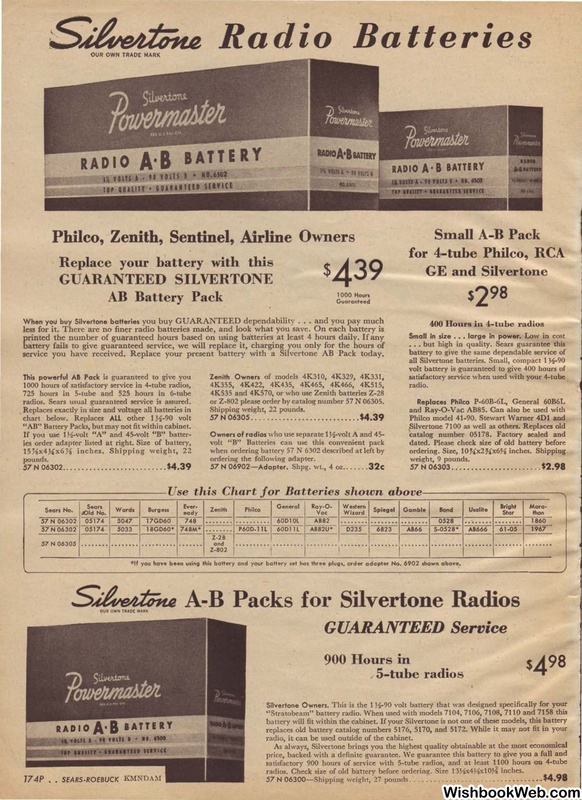 Replace your present battery with a Silvertone AB Pack today. radios. Sears usual guaranteed service is assured. "AB" Battery Packs, but may not fit within cabinet. or Z-802 please order by catalog number 57 N 06305. 18GD6o• 748M• -.• - .-.-. -•.-. battery will fit within the cabinet. radio, it can be used outside of the cabinet. radios. Check size of old ba"ttery before ordering. Size 13Ysx4Ysx10Ys inches.